It’s 2013. Do you know where your classroom is? For Plymouth State students 15 years ago, the answer would have been straightforward: Hyde 301, Rounds 212, the Boyd meteorology lab. Today, however, technology has changed where—and how—we learn and teach. Your “classroom” may still be in Hyde, but it could just as easily be in your residence hall bedroom or downtown Plymouth. You could be in Montana or China. You may come home from your full-time job, eat dinner, and only crack open the laptop at 9:30. Or you may be sitting outside with your tablet, observing a video lecture created by your psychology professor in preparation for tomorrow’s class. As so often happens with major transformations, one or two pioneers must be willing to take the initial risks. Fifteen years ago, Professor of Business Bonnie Bechard stepped into that role, offering PSU’s first online course for the MBA program. As a new mother, Bechard was seeking a way to integrate the demands of her role as a parent with her teaching career. “I was so excited and motivated to try this new thing,” she says, “and so determined to make it work.” Even so, establishing the online solution was a challenge. Technology was slow, awkward, and sometimes unsophisticated; many people were still using dial-up. “It felt very lonely and it felt very bold,” Bechard says. Fast forward to today: the MBA program has been fully online for a decade, attracting professionals from China, Romania, India, Sweden, the Caribbean, and around the world. It has been ranked in the top twenty on the list of “Best Online MBA Programs” in the country by GetEducated.com, the national guide to online colleges. And the MBA program is just the tip of the online iceberg. Four undergraduate degrees are offered fully online as well as on-site: Business Administration, Communications and Media Studies, Criminal Justice, and Nursing (the completion program for registered nurses). In her 2013 State of the University address, PSU President Sara Jayne Steen reported that this year, through the College of Graduate Studies and the Division of Online and Continuing Studies, PSU had 5,000 online enrollments—for 15,000 credit hours, one-half of all online programming offered by the University System of New Hampshire. And as Robison notes, Plymouth State is known for its student-centered, “high-touch” campus life. With technology having become such a crucial part of education, he asks, “How do we communicate that sense of community, where the campus is located, the exceptionally involved educators, the great student services … how do we translate that and draw in students from out of state or out of the country?” Using carefully vetted online resources allows faculty to reach everyone in—and outside of—the classroom. Plymouth State faculty are adept at researching, selecting, and even designing the tools that work best for their courses and students. Many faculty use open-source conferencing systems like Big Blue Button, for example, which allows instructors to present practicums and hold meetings with their students remotely. Others find innovative ways of presenting classes to distant learners. When one of counselor education professor Hridaya Hall’s clinical mental health counseling students, Philip Meher ’12G, was deployed to Kuwait in 2011, he was able to continue with his practicum coursework via Skype and Moodle (PSU’s virtual learning management system). Meher was even able to take part in real-time weekly group supervisions, a requirement of clinical mental health accreditation. Hall says, “His Plymouth peers’ educational experience was greatly enriched as they were able to interact with a peer in an active deployment setting and learn about unique issues facing soldiers.” Meher currently serves as an Army chaplain with the NH National Guard and a readjustment-counseling therapist working with combat veterans from all eras including Vietnam. Completing his coursework online allowed him to get into the workforce sooner: “I could not have begun my internship in September 2011 if I had not been able to do this practicum while overseas,” Meher says. A major advantage of technology is that it allows different types of learners to access traditional—and nontraditional—curricula through the Internet. Online education can be asynchronous, meaning that the information is shared outside the constraints of time and place. This greatly increases the flexibility and availability of education to all learners. Trent Boggess, dean of the College of Business Administration, believes that online education is, simply, “diversification of delivery techniques. You get the same great professors, teaching the same great courses, online as well as in person.” What’s different is that students can receive some of the material on their own time, through their own devices, and can participate in a multitude of ways, not simply in a classroom setting: they can virtually raise their hand (with a click on an icon) and speak in an e-conference, text their professors, Facebook chat with classmates, or collaborate on projects with international peers through cloud-based sharing systems. With so many e-learning tools emerging, sometimes it’s the “old” standbys students are already using that end up being the most effective learning tools. Faculty use YouTube, for example, to post recorded videos of their lectures for students to view at their convenience. When students attend class the next day, they are prepared to discuss what they have learned. This model is sometimes called the “flipped classroom,” or “reverse instruction.” Rather than spending class time listening to a lecture, students spend this time together applying their new knowledge and problem solving. The ubiquitous smartphone is another tech tool faculty are co-opting from students’ purely social use. When the town of Plymouth asked PSU’s history department if students could come up with a project to help celebrate the town’s 250th anniversary this year, history professor Linda Upham-Bornstein and her Public History students were eager to bring history to the public in a dynamic, forward-looking way. “When students choose a history career,” Upham-Bornstein says, “the frustration is that it can seem so insular or book-oriented. How can you apply it to the real world?” In addition to studying the field of public history, students in this class are expected to learn about technology that’s appropriate for a twenty-first century career in history. 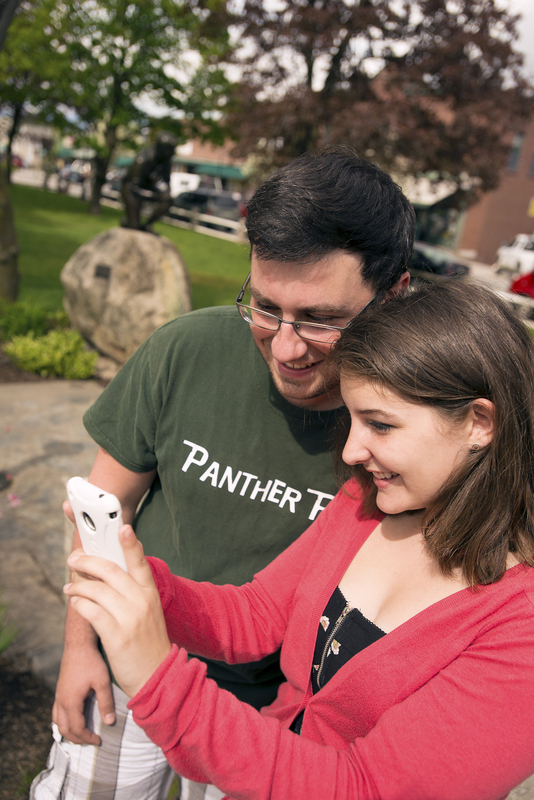 PSU students Kyle Martin and Kayla Claire demonstrate how smartphone apps and QR codes reveal the stories behind iconic Plymouth landmarks. John McKeith photo. Ultimately, the students chose a layered solution—creating a QR code tour of Plymouth and incorporating Field Trip—that was accessible to the broadest possible audience, from locals to out-of-towners. Students delved into the stories behind Plymouth’s iconic architecture, culture, and sculpture, using oral histories and background research to create entertaining and informative Web pages on the Plymouth town site. They designed the site with geotags that allowed Field Trip to work with the specific Plymouth locations. The young historians then assigned QR codes to the structures, including the Daniel Webster Courthouse, the Plymouth Railroad Station, and the Congregational Church. Visitors scan the code with their smartphone or other imaging device, which interprets the symbol and instantly directs the viewer to the website (Onthisspot.org). Students worked closely with geography faculty member John Lennon, who not only consulted with Plymouth State’s information technology staff to determine changes that needed to be made to the Town of Plymouth’s WordPress blog, but also communicated directly with Google regarding this and other PSU projects. The interactivity and interconnectedness of today’s online systems allows students to more actively participate in their learning. Students who tend to be reticent in a classroom setting are often far more open to discourse in the relative security of an online setting. Students who hold down full- or part-time jobs appreciate the flexibility of online or blended classrooms, which allow them to give their full attention to their schoolwork when it best fits their schedule. And variations on the traditional schedule and delivery modes can allow more time for any student to do field work, process information during the times they are most receptive, and operate in a familiar digital landscape. What amazing new app is waiting in the wings? What innovative system will revolutionize learning? Time—and at the rate technology evolves, not much of it—will tell. The one thing we can be sure of is that technology will continue to advance and PSU faculty will always be ready to make it their own.